I’m sipping three shots of coffee from my AeroPress this morning. I have a hunch it’ll be necessary. 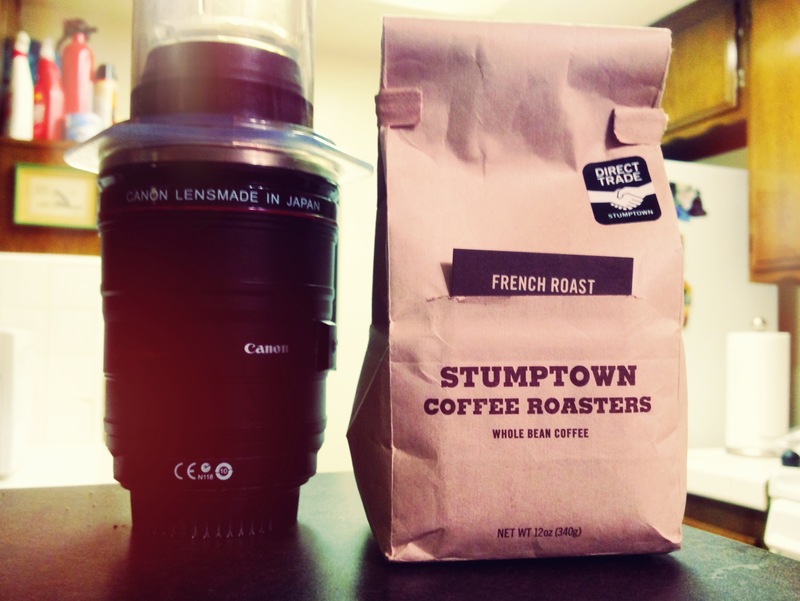 Thanks to my coworker, Andrew Spittle, for bringing me a bag of delicious Stumptown Coffee (French Roast) from Portland. We would’ve drank this while we were in Tybee, but the house didn’t have a grinder. This photo was taken last week, but I forgot to post it. A few weeks ago, the rubber stopper on my AeroPress started to come off easily when removing the plunger from the chamber. It didn’t affect its operation – it was just annoying. So, I emailed Aerobie received a very quick reply that they’d send a replacement seal. A few business days later, I received it in the mail, removed the old one, and popped on the new one. Perfect! I’ve had the AeroPress since March 2007 – over a year and a half now. It still works perfectly. There I was, running in the desert towards our military base. There were enemy soldiers pursuing me. At one point, there was an abandoned yellow bus which I momentarily took refuge behind. Inside were a bunch of Dunkin Donuts coffee bags. I was almost out of coffee grounds, so I gathered as much I could fit in my Jack Pack, then we bolted out. The coffee grinds were my ammo. I fired them out of my AeroPress and they exploded upon impact. I basically had a handheld mortar. An enemy soldier got in front of us and tried to shoot, but his rifle jammed. I quickly fired my AeroPress and blew him up to smithereens. Dream last night: involvement fighting in some war in the Middle East. Weapon of choice? AeroPress. I’m on a break at work. I need coffee, and I’m not going to walk to Starbucks. Our kitchen has brewed coffee, so I’ll try it. My AeroPress is still rocking since I bought it almost two months ago! 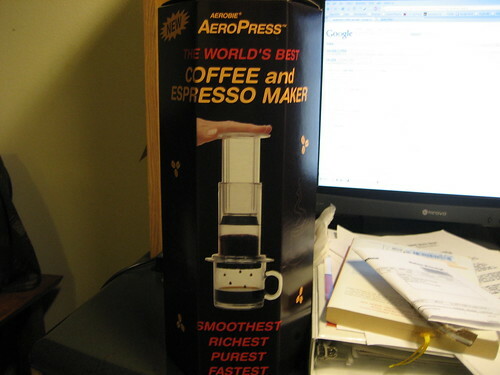 Have you read my Aeropress review? It’s worth buying! I rarely go to Starbucks anymore, except to buy more coffee beans.